o and pick up smash for refills!! this isn't gonna last you long enough if you really tag, the colors and thickness are way similar..
for example i got the k60 & k66 in green and an 8oz of smash teal legit (the green is about two, three shades darker than the teal) but it was perfect! i can write with it all i want without switching markers to conserve the ink or paint (whichever it is). Been getting heavy on trying different pens recently, and thus far, even after testing the steel blitz, these are my favorites. The way it sits in my hand is super comfortable. It writes smoother than any other pen Ive used. Also I really love how thin the lines can be while still tapering depending on how you squeeze and flick it. ... BUT... then I actually gave it a good 10 minutes of practicing on a sign I have laying around, and I got used to it. You have to be extremely even with the pressure on it, squeezing light but firm, while pressing it to the surface with just the right pressure. If you squeeze too hard, it shoots wildly (which could look good if you know what youre doing), if you press too hard, the ball in the head gets stuck and wont roll. But just trust me, after giving it a moment, and really finding the sweet spot, I guarantee youll be in love. I notice they take about 10 tags to break in to where itll feel smooth. My best advice to you? Buy one, find a nice spot somewhere about shoulder height, hidden away where no one will find your toyish warm up tags. And just get used to the pen, youll find just where it needs to be if you give it a solid try. The ball has a light tender feeling to it when it clicks into its place, and the tube feels just malleable enough when youre squeezing it right. Youll love it for sure. Still try out a steel blitz as well. They write thicker, and theyre cheaper. But I tell ya. Regardless. This is a darn good pen. I really like it. Not really about that swanging and tag banging anymore but those colours; they're just unreal. So I copped two of these markers in red and yellow, grabbed a couple of forties and my homie and I were off. The K-66 seemed to do its job pretty good, only flaw with these rapscallions is that we only ended up going through half of the mop before the ball on the tip fell out of both markers. Granted we both are hard on markers but for close to twenty bucks each mop Krink needs to step his game up. 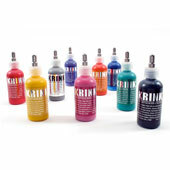 these are the sh*t but but as all other krink products they are expensive. buy it!